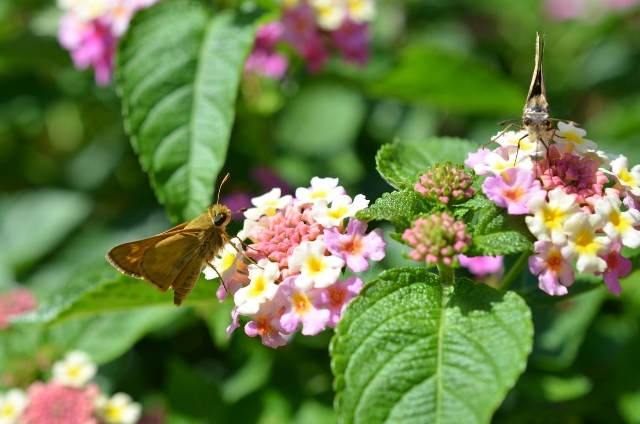 Two Sachem Skipper butterflies (Atalopedes campestris) on Lantana blossoms. The greenish Sachem is the male. I believe the other Skipper is the female but did not get a clear identification. For anyone interested in butterfly identification, the Gardens with Wings site is very helpful in figuring out the correct name of the butterfly. You can search by open wing color or closed wing color, in addition to common name or size. For several years I had wanted to start learn to identify butterflies and with the help of Gardens with Wings and a visiting four-year-old granddaughter, it is finally happening this summer.